It’s coming for all of us this June, and your best bet to survive it is to spend some time with GayCo! It’s our 19th year, but we have a fake ID, so we’re ready to get into some adult trouble this summer! For the 3rd year in a row, GayCo will present their annual pride show at the PlayGround Theatre in the heart of Boystown! Even the biggest gays in town are settling down, like our own “Pridezilla”; but he and his partner Estaban have a beautiful lesbian child of their own this year! Check out www.gayco.com for the schedule of Gay-lebrities as they are announced. DAUGHTER OF PRIDEZILLA runs Fridays and Saturdays at 10pm over both Pride weekends (June 19-20, June 26-27) at Boystown’s very own Playground Theater (3209 N. Halsted). Friday June 19th – A.K. Miller! Check out MidTangent Productions Theater Company! Saturday June 2oth – Scott Duff! Listen to OUT CHICAGO on WCPT 820AM! Friday June 26th – Nirmalpal Sachdev! Check out Steamworks Chicago (if yer a dude)! Saturday June 27th – Tamale Sepp! Check out the Brass Chuckles Comedy night at Uptown Underground every Wednesday! To reserve or pay by credit card in advance – Click here! To pay cash and pick up at Will Call – Email reservations@the-playground.com or call (773) 871-3793. Every Night has All Star Improvisors! 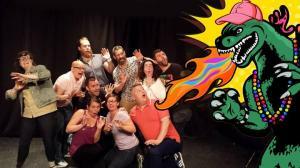 Chicago’s best improvisers join the GayCo ensemble to bring the funny! You are not going to want to miss this!